A Special Occasion Needs a Dynamite Look. 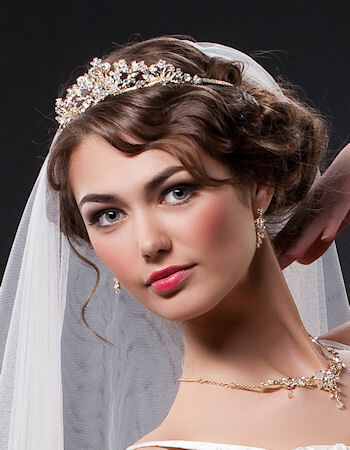 Wedding Styles for Long Hair. This curly, blond example proves a simple finish is classy and elegant enough for a wedding or special prom night. The ringlets fall to the sides in a wavy fashion to just about shoulder length. Even though the style is pushed forward to cover the ears and neck, it still incorporates earrings and necklaces readily. Most volume is found at the crown, the side sections are drawn back in large twists and finished with flowers. Overleaf the bangs are pushed across the forehead over the right side. Several longer flicks come down cover the right side of the face and end distinctly around the chin. The left side includes several straight flicks that come down past the middle of the cheek and over the shoulder. Further down, thin, short curls are incorporated to supply incredible volume. The top is straight with a straight central part. A few clips or barrettes to pull the hair back. This means that the ears and neck are partially uncovered to be freely adorned. Position Nine. Quintessential for a Bride. Straight, dark and falls below the shoulder blades, pulled to reveal the neck and ears. A slightly ruffled finish decorates some shorter pieces. The straight hair described in layers to create a voluminous fringed front edge. Bunches are gathered behind to create a smaller fringe. Many heads will turn to see what attracted the attention. The vintage example has locks falling below the shoulders that are pushed and tucked into a band at the back leaving the ears and shoulders exposed so appropriate jewelry will be clearly visible. The ends are neatly layered and flicked to frame the face. The ends are also slightly curled for a mussed finish and contain hardly any volume for a flattering look. The top is parted, slightly and the defined bangs fall to about chin length and are flicked inward. Over the Shoulder Brooding Dark Raven Locks. Straight, dark raven tresses held in a very loose updo. The length has been wrapped around itself on top with the ends sticking out. Several flicks also come across forming no discernible part. This strawberry blonde style is relatively simple but utilizes all the contrasting elements you need for a great prom style. First, sweeping curls are formed on both sides, lying just above the ears and pinned on one side with a flower accessory. The addition of the unobtrusive veil makes this more of a bridal style at face value especially with the tiara but you can adapt it to suit your needs, after all, it's a vintage faux bob. Victory rolls became popular towards the conclusion of World War Two, they resemble the maneuver a pilot might make to signal and celebrate a victory, hence the name. They were therefore worn to show support for airman and Allied Forces in general. This retro look gives life and vitality to any ensemble. The curls and waves extend the full length and include the top which has a straight part off-center. It's additionally curled under at the back and sits just above the neckline. The back is bunched to produce a huge blonde ponytail, the sides are simply incorporated into the pony whereas the top is sectioned into six or seven and twisted or braided to form loose cornrows. Recreate by using a clip on ponytail if you don't have enough length and experiment with the cornrows to suit your locks. A classy, yet almost playful finish. The result does a beautiful job, effectively framing the face. The long, brownish chestnut effect is formed into curls and waves for a seductive polish. While sleek, it's also slight mussed as it falls below the shoulders. There's a splash of creative volume but it's not overwhelming. A section at the crown is clipped into a bubble. The face is framed with a few shorter bangs and flicks on the sides. Lengthy, golden waves have been pulled into two victory rolls. The rolls are not well-defined and you have to look closely to spot them. The volume that falls behind is wavy and falls to shoulder length behind the body with a few stray strands draped over the shoulder as she peers over it in a coquettish manner. There is no apparent part but the bangs are left free and slightly curled. They fall in the middle of the forehead before being brushed over to the side. The fringe ends with a few longer strands. Traditional bridal updo on dark locks with a feature fringe curled to one side. Sultry, yet glamorous by virtue of pinning up leaving the sides to become adorably prominent. It incorporates long, dark hair with lighter streaks evolving into wavy side sections. Ruffles and a mussed finish combine with body to produce an alluring effect. Shorter wisps and flicks frame the face. The volume on top is straighter and parted to the side. The bangs are swept and have some short flicks upward on the ends. Make an impression on prom night or a special occasion with this exceptional suggestion! Turn a classic design on its head with the wisps falling to the sides and the curls above. A crown braid hems the bulk in front with a wave or two and the whole thing is completed using daisies. The most distinctive section is the crown where thick waves contrast the straight pieces. This special hairstyle is unique in that it incorporates several different elements for a glamorous appearance. The slides of the blonde locks have been teased in order to keep them individual and defined. The sides are curved and waved as it falls past the neckline and has been pushed to the front. The sides also have several pinned sections with pearl hairpins. The crown is mostly straight and flat with a part above one eye.